Facebook has clobbered Ravenwood Fair maker LOLapps with a harsh penalty for selling user data to advertisers, cutting the developer off from its "viral channels" for six months. It came out a couple of weeks ago that a number of Facebook apps, including some very popular games, were leaking user IDs to online advertisers and data trackers in violation of the social network's privacy policies. 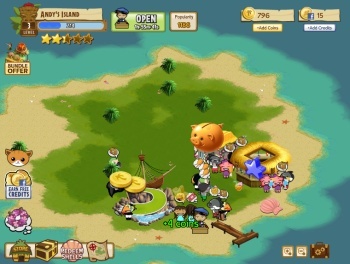 Facebook quickly suspended several of the offending apps, including all those made by LOLapps, although the games were reinstated less than three days later. But now it's dropped the hammer again, this time in a more meaningful way, by cutting off nearly all of LOLapps access to viral channels for a period of six months. The suspension means that users of LOLapps games will not be able to make wall posts, send invitations or share content within the feed of any its titles. One LOLapps game escaped the falling axe: Ravenwood Fair, which was released after the privacy kerfuffle and is LOLapps fastest growing game of the year, with 1.7 million monthly active users. Inside Social Games speculated that Facebook may have given the game a break because it wanted to "avoid the appearance of outright destroying a game developer." LOLapps' Critter Island, on the other hand, which pulls in 1.3 million users, did get cut off. LOLapps was apparently singled out for the lash while other developers just got a warning because it was actually selling user information to advertisers rather than just inadvertently leaking it. It may be a split hair for users who feel their privacy has been violated, but Facebook took the matter seriously enough to deal out some pretty harsh punishment. As Gamezebo noted, "Facebook can make your game with its social network, but it can break a game by removing its viral channels with the flick of a switch."